Sharon Lane is a self-advocate from Cork who is passionate about sport and achieving in her field. In an interview with Julie Helen, Sharon tells us more. My name is Sharon Lane. I am 35 years old. I have a visual impairment and an intellectual disability. I live with my family in Cork. I am supported by Cope Foundation. I am very independent. I like doing my own thing! Tell us how you got involved in sport? I played Special Olympics basketball and soccer. It was something fun to do. In 2010 I won a gold medal at the Munster games and I got a taste for winning. That was my first real introduction to competition in sport. Tell us how sport makes you feel? Playing soccer makes me feel fit, healthy and independent. In 2011 I started to get sick my kidneys failed. It was a really scary time because my mother had passed away before that. I realised how important sport was when I couldn’t play anymore. When I got sick people wrapped me up in cotton wool and didn’t want me to do anything. That was really frustrating. I lost my voice. I felt like I had lost all my confidence. I felt like a 91 year old. That is when I started getting involved in advocacy to get me through the tough time. Tell us about what happened next? On 10th August 2013, I had a kidney transplant. It gave me a second chance at life so I wasn’t going to sit in a corner and do nothing. I was going to make the most of what I had. I got involved in a social club in my service and continued my advocacy work and I wanted to see what else I could do too. I wanted to try new things. In September 2013 I did a six week advocacy course in Cork Institute of Technology. The course was for people in my service but we mixed with students and it showed me what college might be like. Then I realised I wanted to do a course on soccer coaching. Tell us about your soccer course. When I started saying it to people first, that I wanted to do a soccer coaching course they looked at me like I had two heads because I wanted to coach soccer and I can’t see. I researched it and there is soccer for people who are blind. It was developed in Spain. It has a specially designed ball and the game needs a lot of communication. Coaching is the same no matter who you are. I really wanted to do the course so I stuck with it. I completed Soccer Coaching and Education in Stiofan Naofa QQI levels 5 and 6. Tell us about the challenges in your course. First of all, it was hard to get in. People were unsure I would be able to manage but I really wanted to try. 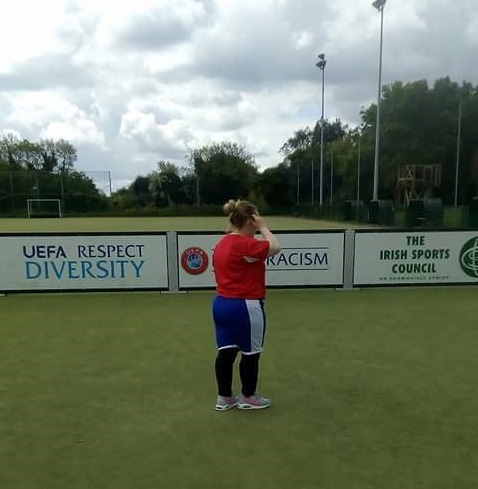 I was really nervous at the beginning but I had good references and an FAI coach backed me all the way. All it takes is a few people to believe in you and it makes all the difference. I was the only woman among 23 lads, so at the start it took my classmates a while to take me seriously. Was it important to you that the course was in a mainstream college? Yes, that was really important. I just want to be the same as everyone else. I am a person with big dreams and I know I have a lot to offer. I don’t want to be stuck in a corner. I want people to expect people with disabilities to be in mainstream education and take part in sport. I play Paralympic soccer now too. I have a special Olympic medal and I want a Paralympic one too. I am proud of who I am and I want to be the best I can be. Why do you love soccer so much? Playing soccer is the only time I don’t have to use my cane, I can run around and have great freedom and just be myself. On our team everyone is treated equally and that feels great. Did the soccer course give you a taste for more? Yes it did. I am about to start year 2 of Holistic and Physical Therapies in the College of Commerce in Cork. I wanted to keep going with the coaching but the next level included lifesaving and working a lot with young kids and not being able to see is a barrier so I needed to find another way around it. I would like to get a job in the area of sport. I might start my own business in holistic therapies. I will keep playing soccer and train for the Paralympics. I wish that in the future people in general will have higher expectations of people with all different kinds of disabilities and give us more opportunities to be involved in education, sport, work and cultural life. What advice would you give to someone that wants to try something new? Go for it. Barriers always make me want to try even harder. Life is for living. All you need is a few people to listen and a bit of support and can do anything you set your mind to. Sharon Lane is a self-advocate from Cork. Sharon is a Special Olympian and student at the College of Commerce in Cork.